Take San Jose International Airport's Guadalupe Pkwy. Exit. Turn left on Guadalupe Pkwy. Follow onto I-101 North. Follow I-101 North roughly three miles and exit at Great America Pkwy. Turn right onto Great America Pkwy. 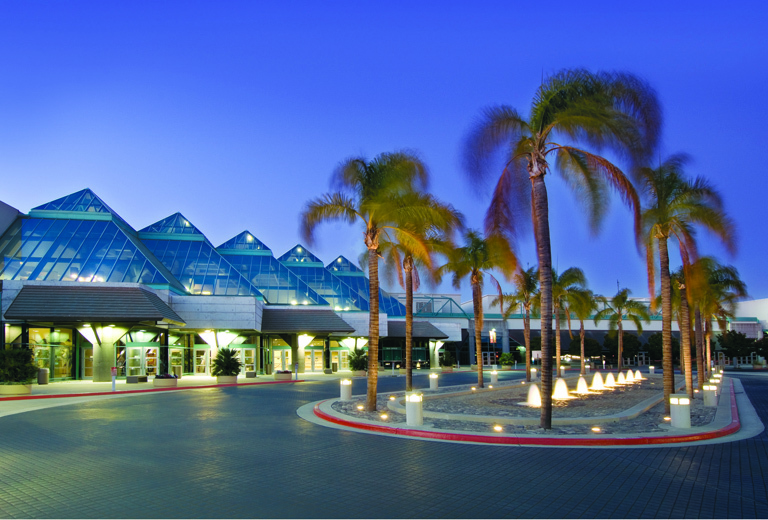 The Silicon Valley Convention Center is located at Great America Pkwy. and Tasman Ave. You can find the Convention Center Parking Garage by exiting at the Hyatt Regency's 2nd driveway at Bunker Hill Rd. Follow San Francisco International Airport's exit signs to I-101 South towards San Jose. Take I-101 South roughly 30-40 minutes and exit at Great America Pkwy. Turn left at Great America Pkwy. The Convention Center is at Great America Pkwy. and Tasman Ave. You can find the Silicon Valley Convention Center Parking Garage by exiting Great America Pkwy. at the Hyatt Regency's 2nd driveway at Bunker Hill Rd. Exit Oakland International Airport and take Hegenberger Rd. to I-880 South towards San Jose. Take I-880 roughly 30-40 minutes to Highway 237 towards Mountain View. Follow Highway 237 to Great America Pkwy. Exit. Turn left on Great America Pkwy. The Convention Center is at Great America Pkwy. and Tasman Ave. You can find the Convention Center Parking Garage by exiting off Great America Pkwy. at the Hyatt Regency's 2nd driveway at Bunker Hill Rd.